There are a few common mistakes that growers should avoid related to their center Pivot management practices. Growers sometimes wait too long to begin irrigating, meaning surface moisture becomes depleted and the grower is left playing catch up. To compensate, they speed up the system and run it around the field every day. When growers do that, they actually hurt themselves more. If the system works really fast a higher portion of the water goes away, it evaporates. Worse still, getting behind on irrigation can cause soil moisture levels to drop below the wilt point (the point at which the soil’s ability to retain water surpasses the plant’s ability to pull water from the soil). As with any type of irrigation system, it is important to monitor the moisture in the soil and apply water when it is needed. The system is there, why not take advantage of it by using chemigation? Using center Pivots to distribute fertilizers can decrease costs and improve flexibility. Some estimates put ground application of crop inputs as much as $2 to $3 more expensive per acre than delivering fertilizer through a pressurized irrigation system. 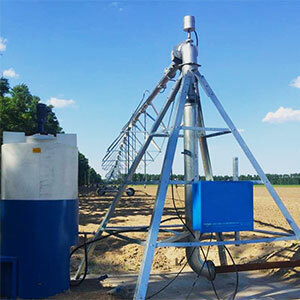 On Pivots that will be run from a public power supply, growers can sometimes find success requesting that their power company improve incoming voltage so that there is proper line voltage throughout the season. A lot of times the power is so low that you will have a brown out. In those situations where the power is inconsistent, it may be wise to contact the power company. Good power provides an efficient running machine, eliminates downtime and certainly improves the life of all electrical components. Farmers can reduce the costs of center Pivot irrigation by finding new and less expensive sources of water. One trend that holds considerable promise is the use of reclaimed water. For example, a facility that produces a large volume of waste water might find it more cost-effective to send the water to local farmers than pay for water treatment or to go through the process required by laws to dispose of the water. Reclaimed water sent to farmers still needs to be treated, but not to the high level that is required if a facility wants to dump waste water in a stream. Treated water is available and becoming more available in a lot of areas. Many times this water is available at no cost. 2 responses to "Improved center Pivot management"
From my point of view, to improve Pivot irrigation management, the following questions should be considered: is the water where it needs to be at the right time?, is it being applied efficiently?, is Pivot irrigation meeting plant water needs?, is the right amount of water being applied?